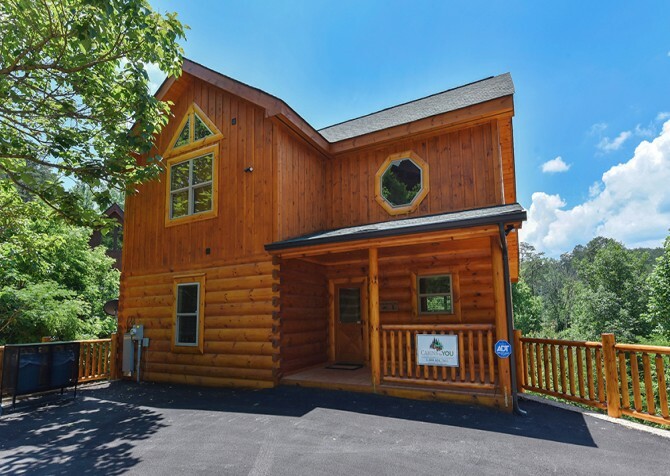 Tucked among the tranquil trees in Pigeon Forge, Tennessee, Bear Hollow is a charming and cozy 3-bedroom, 2-bathroom cabin for 6 that provides the quintessential Smoky Mountain cabin experience. Pull up to an authentic log cabin, with towering trees all around and deck space to spare. 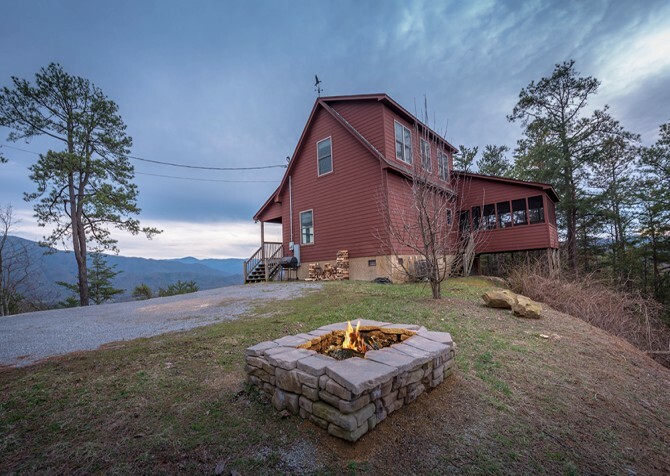 You can spend evenings soaking away in the outdoor hot tub on the covered deck, enjoying peaceful wooded views — and seasonal mountain views — or sipping on your coffee or wine in the rocking chairs. And that’s just outside! Inside, find the comforts of home and lots of fun vacation perks at Bear Hollow. The bedrooms feature a variety of beds to make getaways easy, with 1 king-size bed, 1 full-size bed, and 1 twin-over-full bunk. Each bedroom has its own TV, and you can bring along your favorite movies to pop in the DVD player as you relax in front of the gas fireplace in the living room. Throughout the home, you’ll find unique features like log beds, a canoe, vintage fishing equipment, and cool stone details. Kids will appreciate the Xbox 360; you can have family game night with the board games provided in the cabin; and conveniences like a fully equipped kitchen, wireless internet, and a washer and dryer make stays away from home that much easier! 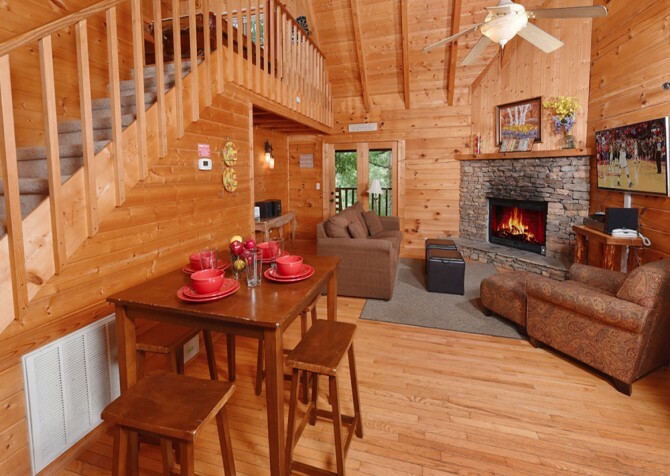 Be it a family vacation or a getaway with friends, Bear Hollow is the perfect cabin for YOU in Pigeon Forge! Unwind in the inviting living room after a long day of travel or fun activities in town. Plop on the plush sofa for a cat nap or prop your feet up in the matching recliners. When evening rolls around, get a fire going in the gas fireplace and chat with friends or flip on the flatscreen TV and play a comedy DVD for a movie night filled with laughs at the cabin. And with tons of natural light pouring through the tree-studded windows, the little ones will enjoy palling around on the large area rug during the day. Featuring stainless-steel appliances, pots and pans, dinnerware, mugs, silverware, and more, the fully equipped kitchen at Bear Hollow is more than ready for all your cooking needs! Prepare gourmet meals, whip up sandwich spreads, create one-of-a-kind desserts, and take on the roll of midnight-snack master. Not interested in cooking while on vacation? Use the space to store yummy snacks from the local grocer and restaurant leftovers from town. At the very least, we’re sure the microwave will come in handy for everyone’s favorite treat on movie nights. Ready for mealtimes with the whole gang? Just off the kitchen lies the dining area with a quaint wooden table, rounded to keep everyone within view and let conversations flow with ease…plus, it provides easy access to seconds in the middle! And the 6 matching stools allow plenty of space for everyone to dine together. And if you want to spread out, simply grab a dinner tray and claim a comfy seat in the living room nearby — Bear Hollow boasts an open floorplan to keep everyone connected. Itching for more amenities? 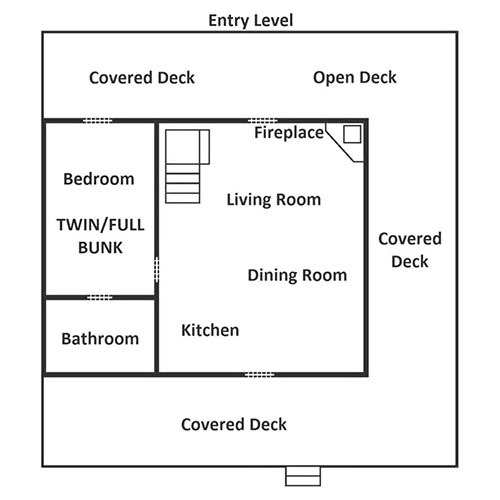 Venture to the lounge loft for a board game at the cabin or a puzzle brought from home. There’s a table with bench seating and a plump couch with a coffee and end table, making this space not only great for games but also nice for soaking in the woodsy views pouring in through the large windows. 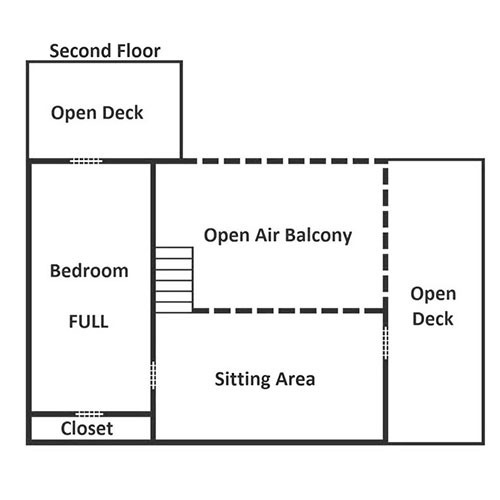 And this loft comes with convenient access to one of the top decks, complete with rocking chairs and a porch swing for morning coffee or midnight moonshine. When everyone is ready to hit the hay, split off into 3 separate bedrooms — each harboring a flatscreen TV and gorgeous log-style furnishings. There’s a king-size bed, great for Mom and Dad, and a full-size bed, perfect for the teens. One bedroom even comes with its own private deck and rocking chairs, and the kids’ room with the twin-over-full bunk boasts an Xbox 360 to keep them entertained for hours on end. Best of all, soothing showers await in the stone-tiled shower, featured in one of the 2 full bathrooms. When you arrive at Bear Hollow, pull up the steep, U-shaped, gravel driveway to a parking area for 2, conveniently located by the cabin entrance. With only 1 step to enter, the wraparound porch welcomes you with ease into this Pigeon Forge home. Before entering, feel free to push your suitcases aside and unwind on the front porch swing and bench. Enjoy lush wooded views in warmer months and seasonal mountain views, best seen in winter. Grill up veggie kabobs and juicy burgers on the gas grill for a barbecue feast in the evening and relax after your meal with a rest in the backyard hammock or a gentle sway in the rocking chairs. When the food has settled, and the board-game champion has claimed victory, hop in the hot tub for a relaxing soak before bed. In the morning, enjoy coffee in the couple’s porch swing, complete with a connected table in the center. 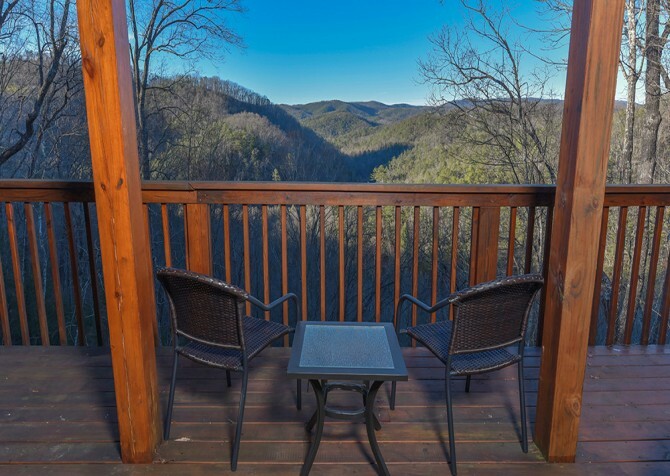 With 4 decks total, Bear Hollow presents plenty of outdoor spaces for all to enjoy on your Smoky Mountain vacation! 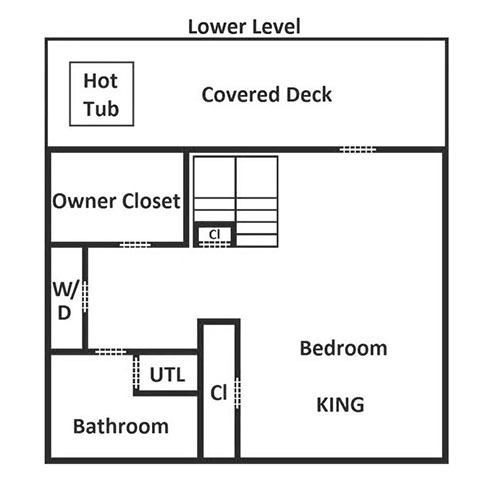 Looking for homey conveniences? Bear Hollow has you covered with a provided washer and dryer to keep your hiking gear fresh and complimentary Wi-Fi to keep you up to date on local events and stream your favorite shows with ease. When you want to get out of the cabin, explore the Great Smoky Mountains National Park, downtown Pigeon Forge and Gatlinburg, and the charming towns of Sevierville and Townsend nearby! Daredevil, are you? Then, Wears Valley Zipline Adventures is the perfect place for YOU! Ride over 1.5 miles of zipline up to 250 feet high through 43 private acres with forested and mountain views along the way. Jump, climb, and play all day at TopJump Trampoline Park, an indoor park with fun trampolines, an extreme climbing center, kids zone, ninja course, candy shop, arcade area, and more! Get ready for an awesome time down the mountain on the Smoky Mountain Alpine Coaster, where you control the speed — up to 27 miles per hour!